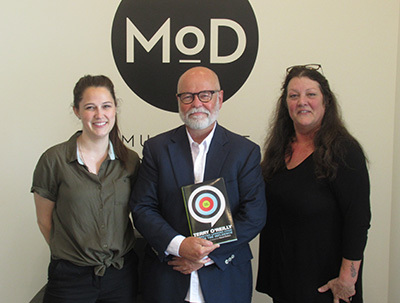 Canadian broadcast producer and personality, Terry O'Reilly, was at the Museum of Dufferin (MoD) this past Sunday, speaking to the audience on his life and career. MoD was packed with fans of Mr. O'Reilly, a resident of Creemore since 2005, sitting down and hearing him speak about his extensive career. Born in Sudbury, he graduated from Ryerson University in the radio, television and arts program. “I didn't know what I wanted to do, I knew I wanted to be in broadcast somewhere,” he said. He is best known as the host of the CBC Radio One series O'Reilly on Advertising, The Age of Persuasion, and most recently Under the Influence. These programs examine the cultural and sociological impact of advertising and marketing on modern life. In 1990, he launched his own advertising production company, Pirate Radio and Television. Mr. O'Reilly has created campaigns for many brands in the country, including Labatt, Molson, Pepsi USA, Goodyear Tires, Tim Hortons, Volkswagen, Nissan, the Hudson's Bay Company, and Toronto Symphony Orchestra. When discussing the changes in advertising, Mr. O'Reilly explained that it was all because of digital technology. “That changed everything, because you could reach people in very quick ways, you can reach a lot of people for not a lot of money.” He said though that it makes advertising more easily tracked, as you know instantly how many people are buying a product or visiting a website. Asked on what is install for the future, he said he would like to eventually write another book, and is in the “planning stages” of taking the show on the road.